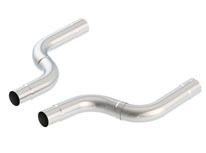 These pipes adapt the 3.0" header collector to a 2.75" mid-pipe. 2016-2019 Camaro SS 6.2L V8 Automatic/Manual Trans. Rear Wheel Drive 2 door with Borla Header 17293.